Surveys find that between two-thirds and three-quarters of students admit to some cheating on tests, homework, and other assignments. Although cheating has been going on for years, cell phones and the Internet offer new opportunities for unethical behavior. Some kids use mobile phones to store notes. Some text friends about answers during quizzes or tests. Others take pictures of test questions, which can be forwarded to students who haven’t yet taken the test. Researchers have identified three general types of students most likely to engage in cheating. Students who are unprepared: These students generally are not chronic cheaters, but may be driven to cheat by unmanageable workloads or overbooked schedules. Students who do not see the relevance of assignments: Cheating is more likely among students who do not understand the point of an assignment, how it relates to them, or what they are meant to learn from it. Students who exhibit high self-confidence, cynicism, and lack of emotional expression: The combination of these three characteristics has been linked to cheating. These students may be chronic cheaters who feel entitled to good grades and do not see ethical problems with cheating. While these students are rare, they are present in all schools. Pressure: Increasing pressure to succeed academically, combined with technology that is widely available and provides an easy means of cheating (e.g. smart phones), have contributed to a culture of cheating across many schools. Motivation: Students who are solely motivated by getting ahead rather than the learning process itself are at higher risk of cheating. 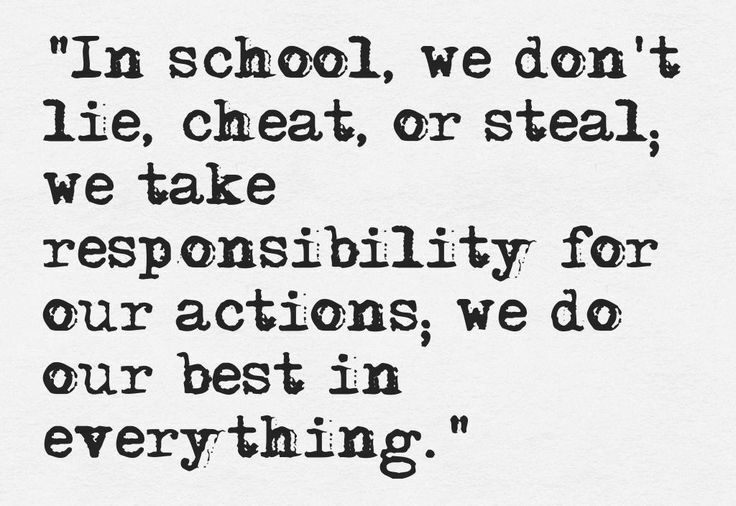 Ethical standards: When students cheat, their sense of right and wrong changes. In other words, the more one cheats, the easier it becomes to rationalize one’s behavior and cheat again. Peer behavior: If students see others cheating and getting away with it, they are more likely to cheat themselves in order to stay competitive. Grade-focused environment: Classes in which there is an emphasis on extrinsic goals (e.g. good grades) instead of mastery goals (learning and improvement) have been linked to cheating. What can be done to address cheating in schools? There should be a school-wide policy on cheating, including serious repercussions based on the severity of the offense, that is enforced consistently. All members of the academic community should view cheating as abhorrent and unacceptable. Class time should be dedicated to promoting academic integrity, educating students on what constitutes cheating, and the consequences of cheating. Teachers should explain the purpose and relevance of each lesson and assignment. Instead of simply learning material to pass an exam, how will this information or the skills they’re practicing be useful to students in the future? Do not allow anything in the room but the test and writing utensils — hats, cell phones, water bottles, and even soda cans can all be used for cheating. Confront cheaters carefully – collect hard evidence and ask students how they came to their answers, rather than directly accusing someone of cheating.